I'm sitting at my desk, working on revisions, and I look out the window in front of me. Fantastic! 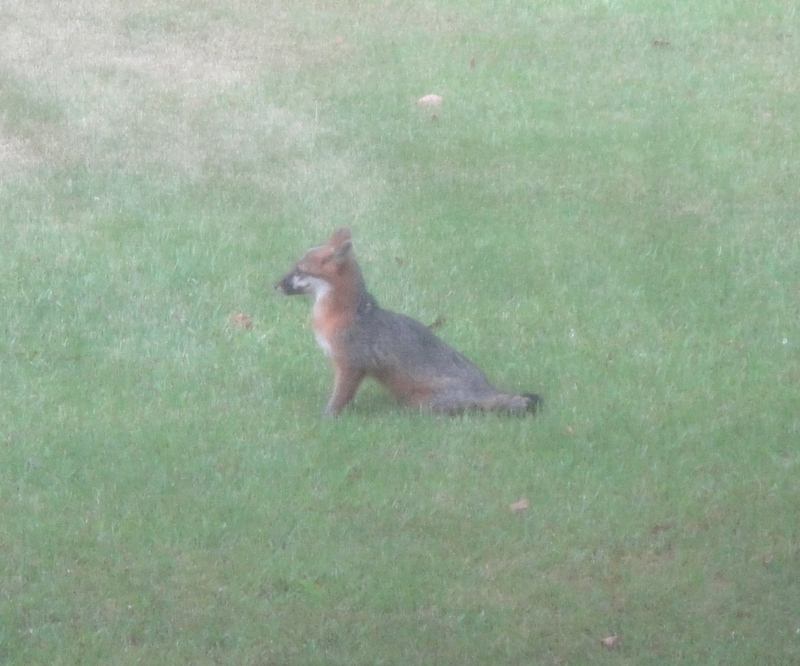 Live foxes are a good omen! They are? Is there a story there? It’s a very cute one. He looks young. Sue, he did to me too. The first time I saw him, he was down at the swing set with two sleeker-looking foxes with longer tails. That is so crazy amazing! My kids would have loved to see something like that! The only foxes around here are in the zoo or at the casinos, lol. Terresa, yeah I grew up in Atlanta so I feel like I’m living in a zoo! Lovely. 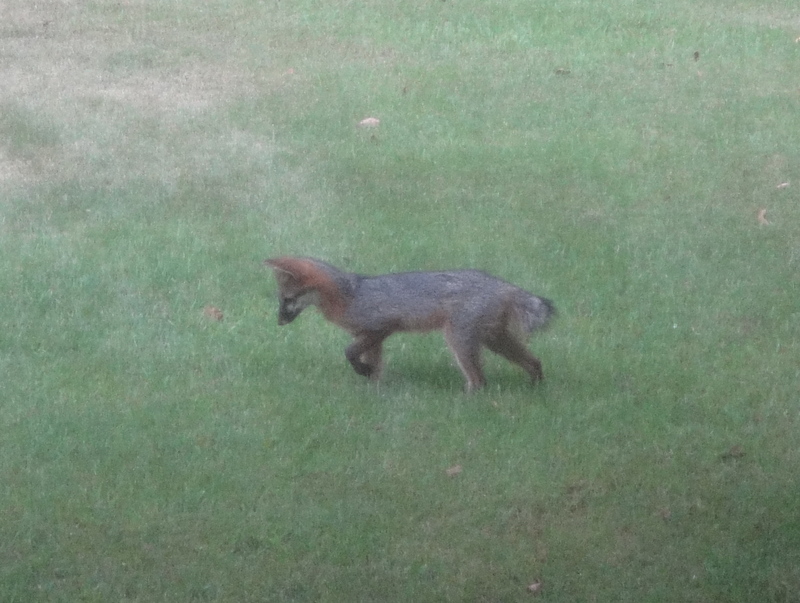 Last month there was one hanging out in my ex-wife’s neighbourhood about a quarter of a mile away–redder than yours. Yours is a curious and rather beautiful colour. Thanks, Doug. One of my other photos of him with his neck stretched out shows a better shot of the patch of red there. If he is young, maybe he will turn redder as he gets older. Cynthia, I also just discovered the “I Like This Post” button at the bottom of your post. Have you used this yet? Doug, I just discovered the LIKE button early last week. I’m not exactly sure when it first appeared on wordpress.com blogs. I added (in fine print) a short notice of its presence to the bottom of the post that day. I had intended to put that notice on all posts for a while. Thanks for the reminder. That same day, I used it at a couple of other blogs, but at the moment it’s obviously hard for me to remember it’s there. I heard you have a particularly good post up on writing. I’m looking forward to reading it and catching up on your posts. I may add this to the post. Wow, a fox! I’d take her as a good omen. It makes me think of Edinburgh by Alexander Chee, which I’m reading slowly and appreciating but didn’t take on vacation. It’s not really a beach book. Thanks for the recommendation. There is a vixen raising her family on my street in Maine, but I haven’t seen her yet. Maybe that’s because my office windows look at my driveway and deck. Sarah, I can’t believe I didn’t think of Edinburgh too. “This is a fox story. Oh how a fox can be a boy.” Thanks for the association. I don’t think so, but he was out playing in the yard again today. Whenever he hears a noise, he takes off running.